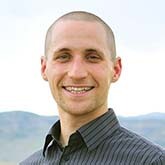 Dr. Nathan Johnson is an assistant professor in The Polytechnic School of the Ira A. Fulton Schools of Engineering at Arizona State University. He is an active researcher and teacher of sustainable and resilient energy systems. Through his work, Dr. Johnson designs, optimizes, builds, and tests energy innovations to address challenges around the world. This work includes fundamental scientific research and applied engineering projects to help bridge the gap between academic research and commercialization. Dr. Johnson’s research team of 20 people incorporates skillsets from six disciplinary backgrounds within his direction of the Laboratory for Energy And Power Solutions (LEAPS). His team actively collaborates with universities, national laboratories, industry, and non-governmental organizations. Arizona State University recognizes Dr. Johnson as a senior sustainability scientist in recognition for his globally focused sustainability efforts. He has spent over two years of field research in developing countries seeking to address energy needs for emerging market economies and the rural poor. He is active within the American Society of Mechanical Engineers (ASME) and the Institute of Electrical and Electronics Engineers (IEEE). Dr. Johnson’s research team is organized into three synergistic cohorts on the below technical themes. These themes incorporate both on-grid and off-grid projects, with learning advancing the curve of research for application to industrialized countries and emerging economies. More details on research laboratories and projects are available here. High Penetration Renewables – Pushing the limit of renewables penetration in the United States, industrialized countries and islands, and emerging economies. Work focused on distributed energy resources, commonly including solar PV backed by various forms of storage and load management. This is extended through distribution network modeling and grid-level simulations of renewables intermittency and mitigation strategies through learning and adaptive control. Further work completed in hybrid power system design to select the appropriate mix of renewable and nonrenewable generators, storage devices, and load control capabilities when considering the effect of dynamic renewable resources, human behavior, grid rate structures, and other factors. Several projects involving concentrating solar power are researched at larger scale with systems analysis incorporating techno-economic modeling and optimization. Micro-Grids and Building Energy Systems – Designing and developing micro-grids for on-grid and off-grid applications. Micro-grid work centers on system sizing and component selection, energy management algorithm design, component testing, and system integration and deployment. Research also centers on self-organizing and adaptive controls for distributed energy resource management with “plug-and-play” micro-grids. Building energy systems research is similar to micro-grid work yet also involves thermal considerations, user comfort, energy management system design, and communications between the building, utility, and third party technology providers. Current applications include residential units, commercial facilities, and campuses. Complex Systems Modeling and Optimization – Developing data-driven models and analysis software for exploring complex systems dynamics. Creating customizable analytical and decision-support tools using a combination of external software tools, in-house software tools, and interactive user interfaces. Some examples include infrastructure interdependency simulation for exploring resiliency theory and practice, and also electrical generation and distribution network simulation during normal operating conditions, environmental stressors, and anthropogenic events. Much of this work is open source to facilitate open discussion and scientific inquiry. Johnson, N. G. and K. M. Bryden. 2013. Clearing the air over cookstoves. Demand 1(1):8-13. Diekman, S., D. Pope, H. Falk, M. Ballesteros, M. Dherani, N. Bruce, D. Meddings, N. G. Johnson and M. Bryden. 2014. Burns, scalds and poisoning. WHO Indoor Air Quality Guidelines: Household Fuel Consumption. World Health Organization. Agyemang, M. and N. G. Johnson. 2015. Development of biomass energy technologies and business models for southern Africa. Proceedings of the 2015 ASME International Design Engineering and Technical Conferences and Computers and Information in Engineering Conference. 2015 ASME International Design Engineering and Technical Conferences and Computers and Information in Engineering Conference. Boston, MA. Janko, S. A., B. T. Gorman, U. P. Singh and N. G. Johnson. 2015. High penetration residential solar photovoltaics and the effect of dust storms on system net load. Proceedings of the 2015 ASME International Design Engineering and Technical Conferences and Computers and Information in Engineering Conference. 2015 ASME International Design Engineering and Technical Conferences and Computers and Information in Engineering Conference. Boston, MA. Reilly, K. M., M. T. Birner and N. G. Johnson. 2015. Measuring air quality using wireless self-powered devices. Proceedings of the 2015 IEEE Global Humanitarian Technology Conference. 2015 IEEE Global Humanitarian Technology Conference. Seattle, Washington. Ashlock, D. A., K. M. Bryden and N. G. Johnson. 2006. Evolutionary Voronoi image segmentation. Proceedings of the 2006 Artificial Neural Networks in Engineering Conference. 2006 Artificial Neural Networks in Engineering Conference. Rolla, Missouri. Johnson, N. G., Y. Lu, R. Mazur, J. Han and K. M. Bryden. 2006. Community leadership for sustainability of bio-renewable cooking technologies in rural China. Proceedings of the 3rd International Conference on Environmental Enhancement and Sustainable Development. 3rd International Conference on Environmental Enhancement and Sustainable Development. Hohhot, Inner Mongolia, China.